Uddevalla is a town and the seat of Uddevalla Municipality in Västra Götaland County, Sweden. In 2010, it had a population of 31,212. It is located at a bay of the south-eastern part of Skagerrak. 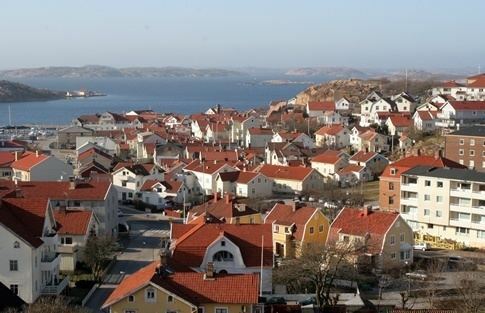 The beaches of Uddevalla are filled with seashells and Uddevalla has one of the largest shell-banks in the world. Uddevalla has a port and it once had a large shipyard, the Uddevallavarvet ("Uddevalla wharf"), which was the largest employer in Bohuslän during the 1960s. The 1970s recession, that affected the Swedish shipyard industry severely, led to the closing of the wharf in 1985. Uddevalla received its town privileges in 1498, but it was probably a place for trade long before that. Formerly, Uddevalla belonged to Norway, and its name today comes from the original Norwegian Oddevald. Due to its close location to Sweden and Denmark, it was often besieged. In 1612, it was burnt down by Swedish troops led by Jesper Mattson Krus and in 1644, it was once again burnt down, this time by Swedish commander Harald Stake. In 1658, it was ceded to Sweden at the treaty of Roskilde. The Norwegians recaptured the town a year later, and in 1660, it was once again ceded to Sweden at the peace treaty of Copenhagen. Later, Norway annexed Uddevalla and the nearby fortress on the Galleberg repeatedly, the last time in 1788. In the 18th and 19th century, Uddevalla's main source of income was herring fishing. The town was also noted for the great fires that damaged the city on several occasions. The most devastating fire was in 1806, when the whole town burned to the ground. Only four houses were left untouched and 4,000 people became homeless. During the 19th century, Uddevalla had trouble getting out of its own recession, poverty and alcoholism were widespread among the population. The reasons were mainly the aftermath of the fire in 1806, the decrease in herring fishing and the opening of the Trollhätte Canal. In 1870–80, Uddevalla began to attract new industries. Much of that development can be attributed to the Scottish businessman William Thorburn, who is said to have been amazed by the town's beauty and therefore settled down in Uddevalla with his wife Jessy Macfie in 1822. He founded a number of industries, starting mostly with textile companies. The building of a new railroad, the Bohus Line, also contributed to the town's recovering economy. A prominent person in Uddevalla's history was Ture Malmgren, newspaper publisher and progressive liberal politician. During the 1958 FIFA World Cup, Uddevalla was one of twelve Swedish towns to host matches, which were played at the Rimnersvallen stadium. After the Swedish shipyard crisis during the 1980s, resulting in the closing of the Uddevallavarvet, Uddevalla suffered an economic setback. Over the thirty years following that, the town has recovered and the population is once again increasing, slowly but steadily. Agnebergshallen is an indoor sports arena for various sports including handball. The home ground for the IK Oddevold is the outdoor arena Rimnersvallen. A large indoor arena, the Rimnershallen, is next to the Rimnersvallen. It is used for handball and floorball as well as other sports. IFK Uddevalla Futsal Swedish Championship gold season 2016/2017.